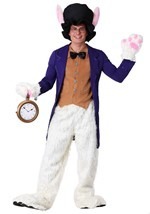 Get a finished look this Halloween by adding these white costume gloves to any of our Alice in Wonderland costumes. These white adult gloves are made of 100% polyester and measure 9" from the tip of the middle finger to the cuff. The perfect way to top off your Tweedle Dee or Tweedle Dum costume.